Laundry can seem like a never-ending chore for caregivers, too. As with most things in life, you can save time or you can save money, but you probably won’t be able to do both at the same time. Allow your loved one to do what she can, while she can. If she can still dress and feed herself, let her, even if she is messy. As those abilities decrease, consider replacing clothes with tricky zippers and buttons with more convenient styles such as pull-on pants. Sometimes pullover tops work better, but for others button-up styles may be easier. The inventor of sweatpants will forever be gratefully remembered by caregivers everywhere. As finances allow, purchase enough simple shirts, sweatpants, and socks so you don’t have to do laundry every day. Eventually you may need to use adult bibs. These are usually backed with a waterproof material and attached around the neck with snaps or Velcro™. Ones with a crumb-catching pocket at the bottom are especially nice. Don’t assume that wearing an adult bib will be insulting. She may be more distressed by the mess she is making than the idea that she needs a bib. When I recently introduced a bib to my mother-in-law, I said, “Look at this beautiful pink I found on this fabric. Let’s put it right here where you can enjoy seeing it,” and I slipped it over her clothes. Pink is her favorite color, so she admired the bib throughout the meal. She was also grateful that it caught those precious spoonfuls of ice cream she sometimes spilled—ice cream is her favorite and she doesn’t want to miss a drop. For her first eighteen months with us, my mother-in-law took care of her own bathroom duties. Because she didn’t always remember to wipe herself, I did lots of laundry. 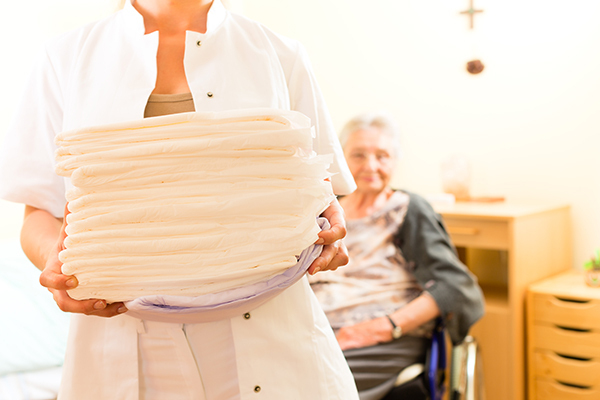 After having surgery, the rehab staff used disposable adult undergarments for Mom. We decided that was a good time to transition out of regular underwear since she had now become accustomed to these pull-up style disposables. For us, the tradeoff for less wear on our septic system and on our washer (and on me!) was worth the additional expense. We never refer to these disposable briefs as diapers. Occasionally she complains about them and we just tell her that the doctor said this kind of underwear was best for her since they keep moisture away from her fragile skin. Most older adults hold doctors in high regard and will obey the doctor’s orders. Over two years later, she still mostly remembers to answer nature’s call, so we’re not changing many times each day. Make bed-making easier for yourself. Consider using a lightweight comforter with a sheet instead of several layers. A puffy, lightweight comforter pulled up over a sheet means you can quickly make her bed without dealing with every little wrinkle underneath. Dark-colored sheets disguise stains better. A waterproof mattress cover protects the mattress; shop for one that isn’t hot or noisy when she rolls over. I’ve found that placing a washable pad between the bottom sheet and the mattress pad means that I don’t have to wash everything when there are accidents, just the sheet and the 2 ft. x 3 ft. pad. Be sure to use a quality laundry detergent and pre-wash stain remover—your time is better spent enjoying your loved one (or getting some rest yourself!) than scrubbing stains. Laundry takes a lot of time and energy. Use as many preventive measures as you can to reduce it. After all, you want to save time for those wonderful conversations when your loved one regales you with stories of days gone by. And a nap is always more enticing than sorting laundry, isn’t it? © 2016 by Marcia K. Washburn writes from her home in Colorado. Through the years, Marcia has cared for four adult relatives in her home, and presently cares for her mother-in-law who has Alzheimer Disease. Marcia is the Assistant Director of Christian Family Eldercare. Her book, Home-Based Eldercare: Stories and Strategies for Caregivers, is available at ChristianFamilyEldercare.org.